Who doesn't want to see the Jets' 1980s uniforms every now and then? We will get on to the apparent reasons that have led us, the audience, to have to endure some of the most atrocious uniforms since the short-lived days of the World Football League (WFL) of the 1970s and their florescent pants, color-coded to boot shortly, but the real trick the NFL is missing with their successful venturing out into midweek obscurity of the Thursday evening television schedule, is a chance to pay real homage to the rich tapestry of its own past. 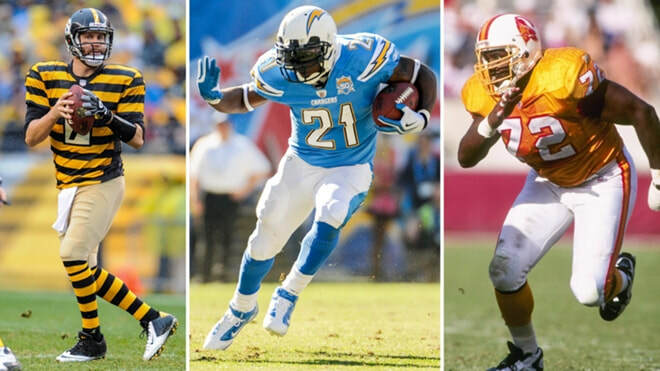 In a slot that features every team during the season, what better way to open up the history of the game to younger fans, as well as offering a slice of nostalgia to long-time fans of the game, by having teams dig out their uniforms of the past – the ones that as soon as they were gone, all fans longed to see again. The Buccaneers in their orange jerseys and the less than menacing outlaw of the high seas on their white helmets. Or perhaps the New York Jets showcasing their 1980s-era “Kelly Green” with green helmets and JETS in the slanting, zooming style of the day. Or what about Falcons with their red helmets? The Patriots with their white ones? 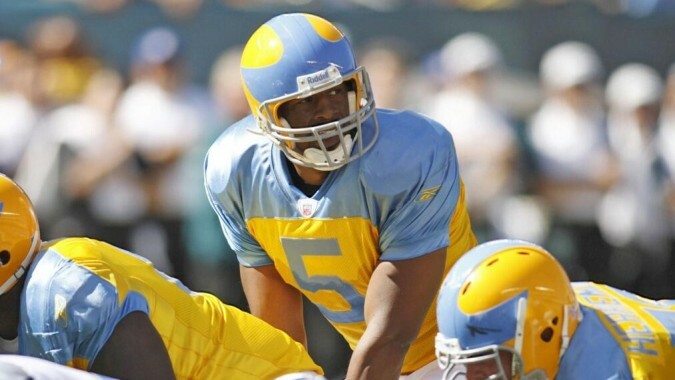 Or, should they dare, the Philadelphia Eagles could bring out their blue and yellow 1930s uniforms that they inflicted on the NFL early in the 2007 campaign in a game against the Detroit Lions (this was to celebrate the team’s 75th season and were based on both the city of Philadelphia’s flag and were the colors of long-defunct NFL team, the Frankford Yellow Jackets – you telling me that’s not a talking point!). The Philadelphia Eagles "first year" uniforms (circa 1933) as worn in a game here against Detroit in the 2007 campaign. Aside from the various history pieces that the TV stations are bound to run, the opportunity for stars of those past teams to make appearances at the stadiums or the in the booth and bridge the gap between the game of then and the contest we see today would be ideal. And if the NFL is a spectacle – which it very much is – as well as being a sport “made for television”, then Throwback Thursdays would surely take on a life of its own. So why isn’t this apparent no-brainer taking place every Thursday evening in various NFL cities across America? According to the research, it is in an effort to combat concussion. Fair play, no doubt. After all, this is still a game and purely entertainment. While we will look at the reasons for this decision in a more scientific, and indeed researched view, in a future article, the thrust of the research apparently suggests that a player must use the same helmet throughout the season, and following this protocol would result in fewer concussions. That being said, in a world where technology is leaping forward at an unprecedented pace, where there are apparent serious discussions and plans in motion to take human beings to another planet, is it too much to think that alternative helmets, using whatever methods are deemed essential, can be made that corresponds completely to those same safety conditions as the original “base” helmet? After all, we are not talking about digging out the leatherhead-type skull caps with no facemask for a 1930s throwback game between the Bears and the Packers! These helmets are modern helmets, made to look – as close as possible – to the helmets of their chosen eras. Or is it not possible to re-strip a helmet of its logo, re-paint, and then re-logo? As much as the cost of doing this for the sake of one game may indeed make it an unattractive financial solution, in real terms, the cost to the owners of the teams would be negligible – not to mention tax-deductible. ​And of course, we have to wonder whether this piece of advice is actually working. Again, while that is a subject to be explored in more detail elsewhere and another time on Beyond The Gameplan, a report in a USA Today article following the 2015 seasons suggested the concussions had actually gone up at 182 in the 2015 campaign compared with 173 in 2012. You can read more about that here. For now though, as we prepare for more assaults to the eyes, not to mention our sense of collective nostalgia, on Thursday Night Football, we can only hope that somewhere, high up in NFL headquarters, someone has a yearning to bring back throw-back uniforms too. Check out the videos below. The first looks at the New England Patriots and a return to the throwback under a potential rule change, while the others look at some of the best and worse throwback uniforms in the NFL. 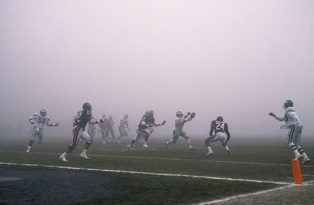 A look at ten NFL games that saw the teams battle the elements as well as each other.